نیکخواه دافچاهی, مصطفی, سرائیان, احمدرضا, رسالتی, حسین, قاسمیان, علی, شاکری, علیرضا. (1397). تولید خمیر حل‌شونده از صنوبر دلتوئیدس با استفاده از پیش‌استخراج قلیایی و فرآیند سودا-آنتراکینون. مجله صنایع چوب و کاغذ ایران, 9(2), 289-298. مصطفی نیکخواه دافچاهی; احمدرضا سرائیان; حسین رسالتی; علی قاسمیان; علیرضا شاکری. "تولید خمیر حل‌شونده از صنوبر دلتوئیدس با استفاده از پیش‌استخراج قلیایی و فرآیند سودا-آنتراکینون". مجله صنایع چوب و کاغذ ایران, 9, 2, 1397, 289-298. نیکخواه دافچاهی, مصطفی, سرائیان, احمدرضا, رسالتی, حسین, قاسمیان, علی, شاکری, علیرضا. (1397). 'تولید خمیر حل‌شونده از صنوبر دلتوئیدس با استفاده از پیش‌استخراج قلیایی و فرآیند سودا-آنتراکینون', مجله صنایع چوب و کاغذ ایران, 9(2), pp. 289-298. نیکخواه دافچاهی, مصطفی, سرائیان, احمدرضا, رسالتی, حسین, قاسمیان, علی, شاکری, علیرضا. تولید خمیر حل‌شونده از صنوبر دلتوئیدس با استفاده از پیش‌استخراج قلیایی و فرآیند سودا-آنتراکینون. مجله صنایع چوب و کاغذ ایران, 1397; 9(2): 289-298. خمیر حل‌شونده به عنوان ماده اولیه‌ در تولید مشتقات سلولزی فراوانی نظیر کربوکسی متیل سلولز، نیتروسلولز، ویسکوز و ... استفاده می-شود. در این تحقیق، قابلیت تولید خمیر حل‌شونده از صنوبر دلتوئیدس با استفاده از پیش‌استخراج قلیایی و فرآیند سودا-آنتراکینون مورد بررسی قرار گرفت. با کنترل پارامتر‌های فرآیندی امکان دست‌یابی به افت بازده حدود 15% در پیش‌استخراج و کاهش 40 درصدی عدد کاپا توسط لیگنین‌زدایی با اکسیژن فراهم شد. نتایج نشان داد که پیش‌استخراج قلیایی سبب بهبود نرخ لیگنین‌زدایی الیاف می‌شود. با استفاده از کاتالیزور قلیایی در مایع پیش‌استخراج، مقدار آلفا-سلولز خمیر حل‌شونده‌ افزایش و درجه روشنی آن کاهش یافت. افزایش فاکتور کاپای مصرفی در رنگ‌بری با توالی رنگ‌بری D0ED1 سبب ارتقای سطح آلفا-سلولز و درجه روشنی خمیر حل‌شونده حاصل شد. لذا در این تحقیق، خمیر حل‌شونده‌ای حاصل از بکارگیری فاکتور کاپای 45/0 در مرحله D0 به علت آلفا-سلولز، درجه روشنی و خلوص بالاتر دارای مطلوبیت بیشتری بوده است. Mahdavi, S., Kermanian, H., Rameani, O. and Molavi, S., 2012. Kraft Pulping of Two Fast Growing Populus euramericana Clones.Journal of Forest and Wood Products. Iranian Journal of Natural Resources, 65(1): 107-118. (In Persian). Al-Dajani, W.W. and Tschirner, U.W., 2008. Preextraction of hemicelluloses and subsequent kraft pulping, Part 1: alkaline extraction. TAPPI journal, 7(6): 3-8. Kouhia, M., Holmberg, H. and Ahtilha, P., 2015. Microalgae-utilizing biorefinery concept for pulp and paper industry: Converting secondary streams into value-added products. Algal Research, 10: 41-47. Saeed, A., Jahan, M.S., Li, H., Liu, Z., Ni, Y. and van Heiningen, A., 2012. Mass balances of components dissolved in the pre-hydrolysis liquor of kraft-based dissolving pulp production process from Canadian hardwoods. Biomass Bioenergy, 39: 14–19. Ibarra, D., Kopcke, V. and Ek, M., 2010. Behavior of different monocomponent endoglucanases on the accessibility and reactivity of dissolving-grade pulps for viscose process. Enzyme and Microbial technology, 47: 355-362. Sixta, H., Iakovlev, M., Testova, L., Roselli, A., Hummel, M., Borrega, M., Van Heiningen, A., Froschauer, C. and Schottenberger, H., 2013. Novel concepts of dissolving pulp production. Cellulose, Springer, 20: 1547-1561. Mehdikhani, H., Jalali Torshizi, H., Jafari Petroudy, R. and Mirshokraei, A., 2016. Carboxymethyl cellulose (CMC) preparation from mixed office wastepaper deinked and bleached bagasse pulps: characterization and comparison. Iranian Journal of Wood and Paper Industries, 7(3): 311-321. (In Persian). Feyzmand, M., Resalati, H., Kermanian, H., Jalali Torshizi, H. and Ramezani, O., 2012. Wheat Straw Pre-Extraction with Hot Water and the Recovered Pulping Liquor and Its Effects on Pulping and Paper Properties. Iranian Journal of Chemistry & Chemical Engineering (IJCCE), 31(3): 71-78. (In Persian). Schild, G. and Sixta, H., 2011. Sulfur-free dissolving pulps and their application for viscose and lyocell. Springer, Cellulose, 18: 1113-1128. Hasanjanzadeh, H., Hedjazi, S. and Jamalirad, L., 2014. Investigation on the Influence of the Alkaline Preextraction of Hemicelluloses on the Properties of Rice Straw Soda-AQ Pulp. Journal of Forest and wood product, 66(4): 493-506. (In Persian). Resalati, H., Asadollahzadeh, M.T. and Ghasemian, A., 2011. The effect of acid catalysis in Hot Water Pre-extraction on Soda-AQ pulping from Kenaf Stem. Wood & Forest Science and Technology,18(3): 107-126. (In Persian). Zhang, H. and Yung, R.A., 2011. Effect of hot water pre-extraction on alkaline pulping and properties of wheat straw. Advance Material Research, 236-238: 1174-1177. Li, G., Fu, S., Zhou, A. and Zhan, H., 2015. Improved cellulose yield in the production of dissolving pulp from Bamboo using acetic acid in prehydrolysis. BioResources, 10(1): 877-886. Hoseinkhani, S., Resalati, H., Saraeian, A.R. and Dehghani, M.R., 2012. Effect of pre- extraction liquid reuse on and soda-AQ pulp properties made up of wheat straw. 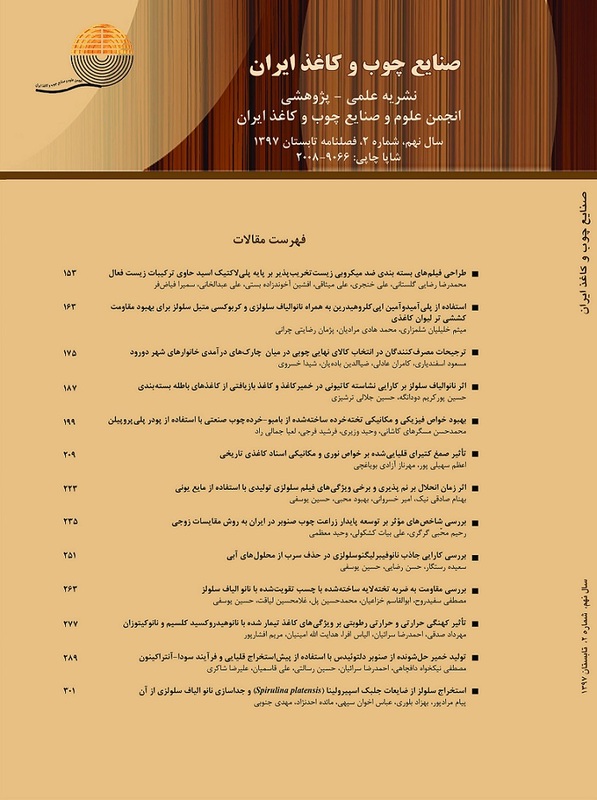 Iranian Journal of Wood and Paper Industries, 4(1): 1-12. (In Persian). Garmaroody, E., Foolladi, H., Jalili Torshizi, H. and Chaharmahali, A., 2015. Comparative study on pulping conditions of cotton linters produced in four different countries for alpha-cellulose pulp production. Iranian Journal of Wood and Paper Science Research, 30(4): 618-631. (In Persian). Nikkhah, M. and Resalati, H., 2015. The potential of acid pre-hydrolyzed Soda-AQ process to manufacture highly purified α-cellulose.Iranian Journal of Wood and Paper Science Research, 30(1): 269-279. (In Persian). Yuan, Z., Wen, Y., Sella Kapu, N., Beatson, R. and Martinez, D.M., 2017. A biorefinery scheme to fractionate bamboo into high-grade dissolving pulp and ethanol. Biotechnol Biofuels, 10:38. 1-17. Asadpour Attoeii, Gh., Alipour M., Zabihzadeh S.M. and Ghazvini, Z., 2016. Effects of hot water and alkali Pretreatment on yield and optical and resistance properties of Hornbeam CMP pulp. Wood & Forest Science and Technology,23(3): 199-220. (In Persian). Behin, J., Mikaniki, F. and Fadaei, Z., 2008. Dissolving pulp (alpha-cellulose) from corn stalk by kraft process. Iranian Journal of Chemical Engineering, IAChE 5(3): 14-28. (In Persian). Alfaro, A., Rivera, A., Perez, A., Yanez, R., Garcıa, J.C. and Lopez, F., 2009. Integral vaporization of two legumes by autohydrolysis and organosolv delignification. Bioresource Technology, 100(1): 440-445. Garrote, G., Dominguez, H. and Parajo, J.C., 2001. Kinetic modelling of corncob autohydrolysis. Process Biochemistry, 36. 571-578. Alén, R., Basic chemistry of wood delignification, In: Stenius, P. (Ed.). 2000. Forest Products Chemistry. Papermaking Science and Technology Series, Fapet Oy, Helsinki, 59–104. Samuelson, O., 1994. Optimized oxygen bleaching of kraft pulp threated with nitrogen dioxide. Tappi Journal, 77: 127-133. Sjogren, B. and Hook, J., 2000. Extended oxygen delignification- The effect of pretreatments and process conditions, International Pulp Bleaching Conference, Halifax, Canada, p 89-96. Azadfar, M.A., Behrooz, R. and Jahan-Latibari, A., 2011. The influence of alkalinity in oxygen delignification of Soda/AQ pulp from old corrugated container. Iranian Journal of Wood and Paper Science Research, 26(2): 232-242. (In Persian). Bouiri, B. and Amrani, M., 2009. Production of dissolving grade pulp from Alfa. BioResources, 5(1): 291-302. Sarwar Jahan, M., Ahsan, L., Noori, A. and Quayyum, M.A., 2008. Process for the production of dissolving pulp from Trema orientalis (Nalita) by prehydrolysis kraft and soda-ethylenediamine (EDA) process. BioResources, 3(3): 816-826. Nikkhah Dafchahi, M. and Resalati, H., 2012. Evaluation of Pre-Hydrolyzed Soda-AQ Dissolving Pulp from Populus Deltoides Using av ODED Bleaching Sequence. BioResources, 7(3): 3283-3292. Kircl, H. and Akgul, M., 2002. Production of dissolving grade pulp from poplar wood by ethanol-water process. Turk Journal of Agriculture, 26: 239-245.